You may be an expert at mechanical design drafts, but if resume draft needs help, view this mechanical designer resume sample for ideas. You draft mechanical designs for a living, but how often do you draft your resume? To be a successful candidate for mechanical designer jobs, resume expert Kim Isaacs says it helps to have a comprehensive resume that impressively demonstrates your skills and experience. 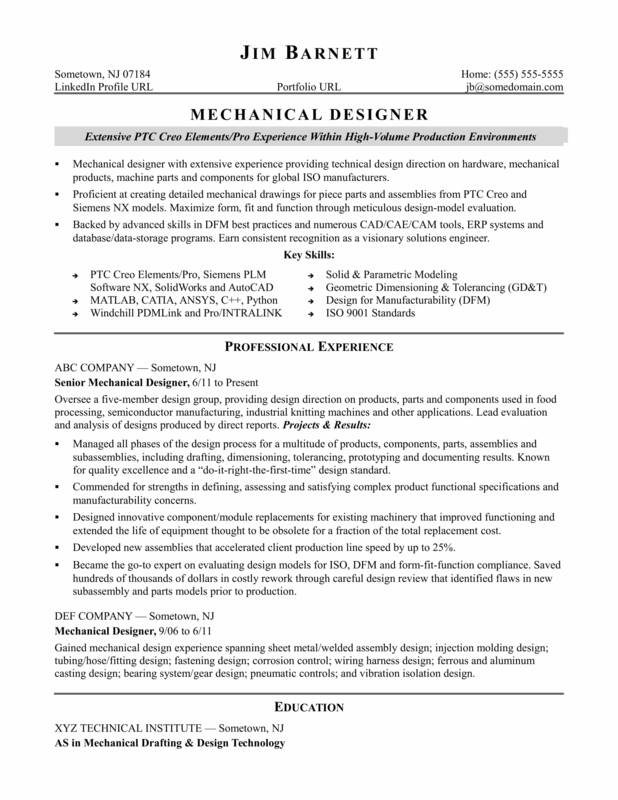 If yours needs an overhaul, view this sample resume for a mechanical designer that Isaacs created below, and download the experienced mechanical designer resume template in Word. Mechanical designer with more than seven years of experience providing technical design direction on hardware, mechanical products, machine parts and components for global ISO manufacturers. Proficient at creating detailed mechanical drawings for piece parts and assemblies from Pro/E/NX models. Adept in maximizing form, fit and function through meticulous design model evaluation. Backed by advanced skills in DFM best practices and numerous CAD/CAE/CAM tools, ERP systems and database/data-storage programs. Earn consistent recognition as a visionary solutions engineer. Managed all phases of the design process for a multitude of products, components, parts, assemblies and subassemblies, including drafting, dimensioning, tolerancing, prototyping and documenting results. Known for quality excellence and a “do-it-right-the-first-time” design standard. Commended for strengths in defining, assessing and satisfying complex product functional specifications and manufacturability concerns. Designed innovative component/module replacements for existing machinery that improved functioning and extended the life of equipment thought to be obsolete for a fraction of the total replacement cost. Developed new assemblies that accelerated client production line speed by up to 25%. Became the go-to expert on evaluating design models for ISO, DFM and form-fit-function compliance. Saved hundreds of thousands of dollars in costly rework through careful design review that identified flaws in new subassembly and parts models prior to production. Gained diverse mechanical design experience spanning sheet metal/welded assembly design; injection molding design; tubing/hose/fitting design; fastening design; corrosion control; wiring harness design; ferrous and aluminum casting design; bearing system/gear design; pneumatic controls; and vibration isolation design. As a mechanical designer, you're familiar with creating models before settling on the finished design. Apply the same logic to your resume. Need some help with the details? Get a free resume evaluation today from the experts at Monster's Resume Writing Service. You'll get detailed feedback in two business days, including a review of your resume's appearance and content, and a prediction of a recruiter's first impression. It's a quick and easy way to make sure all the pieces are in the right place so you can have a successful job search.